Having a pest of any kind is no fun. It leaves you feeling like your house is gross and can make you embarrassed to have people over. Heck, you don’t want to be staying in your infested house, and you certainly don’t want to have to deal with getting bitten. Picture for a moment what it’s like to wake up every morning with unidentified bites on your body (maybe you already know). Imagine how relieving it would feel to find out what was causing those red, itchy bites and to know how to get rid of them. When you start having more days with bites that without, that’s when you know you’ve got a serious problem, not just a random spider or mosquito. That’s when you know it’s time to identify the pest in your home and get rid of it. That’s exactly what you’re about to learn how to do, so read on to discover the difference in flea bites vs bed bug bites. What Are The Differences Between Fleas And Bed Bugs? How Long Do Flea Bites & Bed Bug Bites Take To Heal? 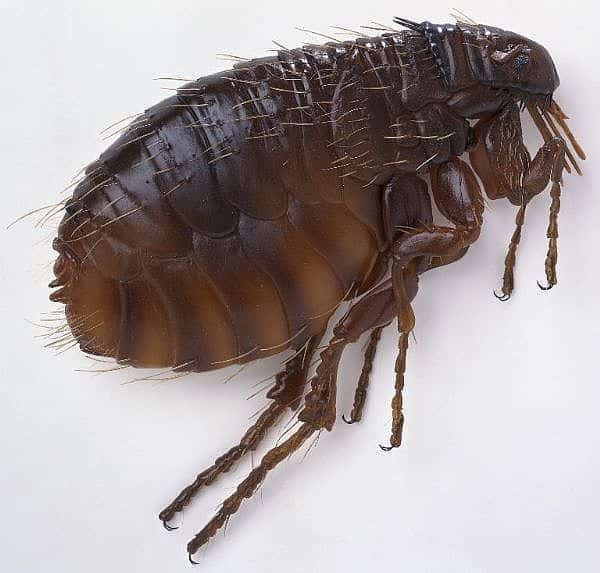 Fleas and bed bugs are both insects, but they are insects of fairly different varieties (the fact that they both feed on blood from a host is an exception, of course). For this reason, there are a few differences to look out for. Fleas are often brought into your home by pets, especially if you allow your pet outdoors. Dogs are especially bad at bringing in fleas because they require going outdoors to urinate, defecate, and get exercise. Cats are the second most likely pet to carry fleas in, and your chance of getting fleas from your cat is reduced if you keep it indoors. Other mammal pets, like rabbits, chinchillas, and guinea pigs, are also less likely to bring in pests if you keep them in the house. That being said, fleas can also get into your home from other sources. For instance, if you have a problem with mice or bats, those animals could also bring fleas into your home. Fleas are extremely tiny insects, but they can jump many times their own height. If you are able to spot the insects that are biting you, and they look like small black dots that bounce around, then you likely have fleas. Fleas are also more likely to be an open infestation rather than hiding. 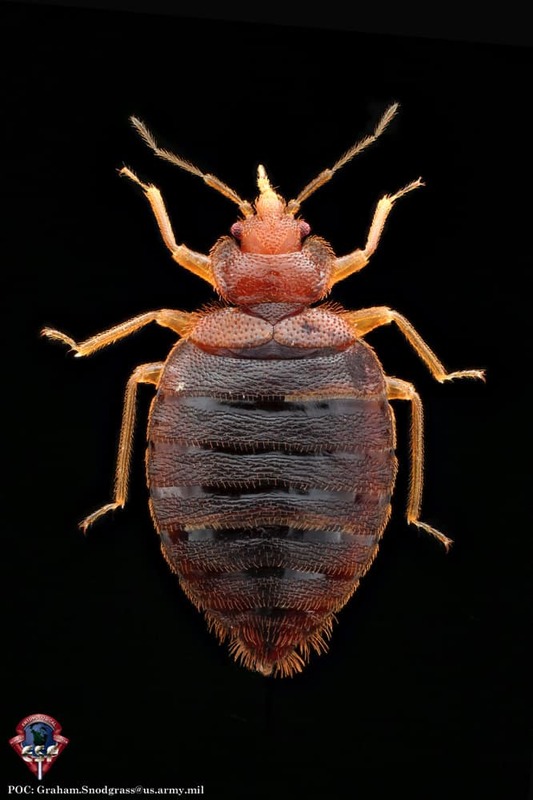 Bed bugs do not usually get carried into your home by pets. That’s because bed bugs’ preferred meal is specifically human blood. Instead, they come in with worn clothing, used bedding, or furniture. You may inadvertently bring bed bugs into your home if you’ve stayed at a hotel or someone else’s home and picked them up in your clothing or your bag. It’s more difficult to spot bed bugs because they prefer to hide and come out when their host is still, before crawling away back into their hiding places before dawn. This is why you’re more likely to be bitten when you’re sleeping, and why most people wake up with bites but no other signs of bed bugs. Bed bugs cannot bounce around like fleas. They have to crawl onto you, and that’s much easier when you’re not moving around. If you do happen to see bed bugs out (they are not truly nocturnal and will come out during the day if they think they can find a meal), you’ll be able to tell the difference between them and fleas in several ways. Bed bugs are reddish brown rather than black, and they are larger than fleas, about one-quarter inch long. As stated, they also do not jump. Flea bites usually appear in numbers, not just as a single bite. This distinguishes them from spider bites, which are usually singular. Mosquitoes may leave a single or multiple bites, depending upon how many mosquitoes are present and how much they need to feed. Flea bites are more likely to be scattered randomly over your body. The reason for this has to do with flea anatomy and capabilities. As mentioned, fleas are excellent jumpers, and that means they tend to jump around while biting you. That allows for their bites to be more randomly distributed than those of bed bugs. Because mosquitoes can fly, they may also leave randomly patterned bites. Mosquito bites, however, tend to be larger than flea bites. Fleas, on the other hand, make small dot-like bites. I mentioned that fleas will bite at any time of day, whether you’re active or not. They can do this because they are so easily mobile, jumping from host to host and riding along on skin and fur. Because of that, the most common place to see flea bites is on the ankles and legs, where they’ve jumped onto you from the floor or a pet. That being said, fleas can bite pretty much anywhere. Fleas will bite all the time, making them particularly annoying. Like flea bites, bed bug bites also often appear in groups. The bugs may bite a few different spots to find the best access to blood, or they may feed for a while in one place and then move on to another spot for fresh access. It is also possible to have more than one bug feeding on you at a time. Unlike fleas, bed bugs do not jump, so their bites are less likely to be scattered across a wide area. Bed bug bites, instead, are more likely to be in a line or cluster. That’s because the bed bug has to crawl across your skin, so it usually feeds in one area. In fact, bed bug bites often make lines or rows. Bed bug bites actually look a lot more like mosquito bites than flea bites do, and that can make them difficult to identify, especially since you rarely see the bed bugs with them preferring to feed while you sleep. These bites are less likely to be on the ankles because of the bed bug strategy to crawl onto you from furniture. They will bite almost anywhere, but especially where they can get good access to blood flow. Bed bugs only need to feed every few weeks, so just because you go a few days without new bites does not mean you should wait to treat the infestation. Both flea and bed bug bites itch. In fact, they can itch like crazy. Your best bet, however, is to avoid scratching the bites. Scratching only makes them more inflamed, which leads to further itching. Even worse though, scratching can reopen the bites and let in bacteria, leading to infection. If you get an infection, you’ve taken a minor itchy inconvenience and turned it into a more difficult to treat health problem. Additionally, you can scar your skin by scratching bug bites too much. When kept clean and left alone, flea bites and bed bug bites should go away on their own. It only takes about a week for a bed bug bite to clear up. Although flea bites also clear up quickly, it may not seem like it if you have a bad infestation and get bitten repeatedly. Some people also have allergic reactions to the bites of either of these bugs. When that happens, it can make the skin more swollen and itchy, or you may develop hives or another type of rash. These conditions also tend to clear up within a week. Bites that become infected will take longer to heal and require more care. Both flea bites and bed bug bites are treated in pretty much the same way, as far as returning the health of your skin. 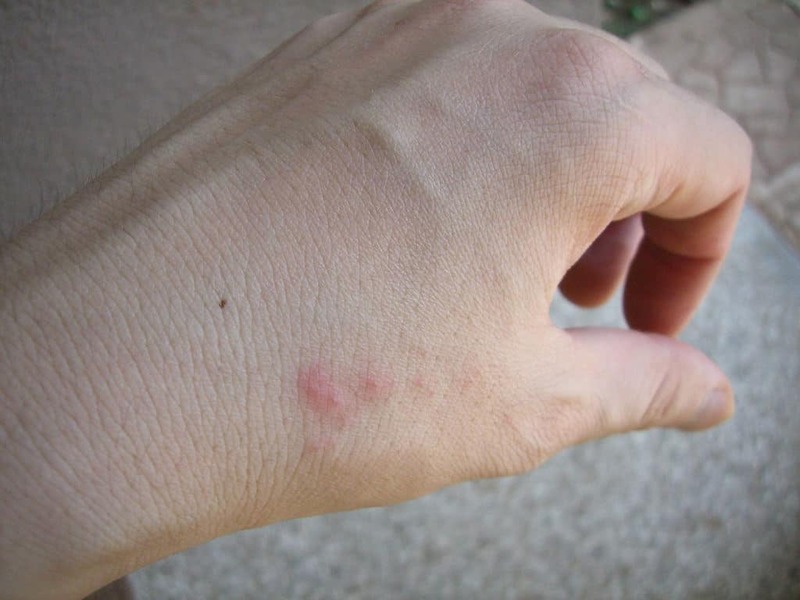 The first step to treating these insect bites is to keep the skin clean, and as mentioned, not to scratch them. You can make it easier to avoid scratching by using a topical anti-itch treatment. Gentle treatments made from baking soda are available, or you can make your own baking soda paste with baking soda and a bit of water. Apply the paste to the bites. For especially itchy or swollen bites, a steroid cream or ointment, like hydrocortisone, will work better to stop itching and reduce the size of the bites faster. Topical hydrocortisone is available over-the-counter. For allergic reactions to bug bites, you will benefit from an antihistamine. Oral antihistamines like Benadryl work quickly. You can also use topical antihistamines if you don’t want the side effects of oral antihistamines, like drowsiness. In fact, a topical antihistamine will also help take away the itch, even if you don’t have a severe allergic reaction. You can try a topical antihistamine in place of baking soda or hydrocortisone, if you prefer. Use whichever of these works for you. The other thing you will need to do is prevent future bites from happening. That requires pest control measures to get rid of the fleas or bed bugs in your home. Bug bites are a major inconvenience. Although fleas and bed bugs are not known to spread diseases, you can get a skin infection from scratching or otherwise injuring the bite wounds. After treating your skin, identify which pests you are dealing with and get rid of them fast.